Home » THE FINEST HOURS Review: Wonderful or Waterlogged? Disney’s new release THE FINEST HOURS is opening this weekend. January + a new movie has, in the past, almost always been a losing equation. As a critic and eternal optimist, i’m always hoping January will become the new June, just like after Captain America: The Winter Soldier, March became the new May. So, will stars Chris Pine and Casey Affleck break the cinematic stigma of a snowy Winter release? Off the coast of Cape Cod on February 18th, 1952, a blizzard wreaked havoc with two oil tankers, splitting them both in two. A daring rescue was undertaken by four members of the Coast Guard that miraculously saved 32 lives on the tanker called The Pendleton, and to this day it’s considered their greatest success. 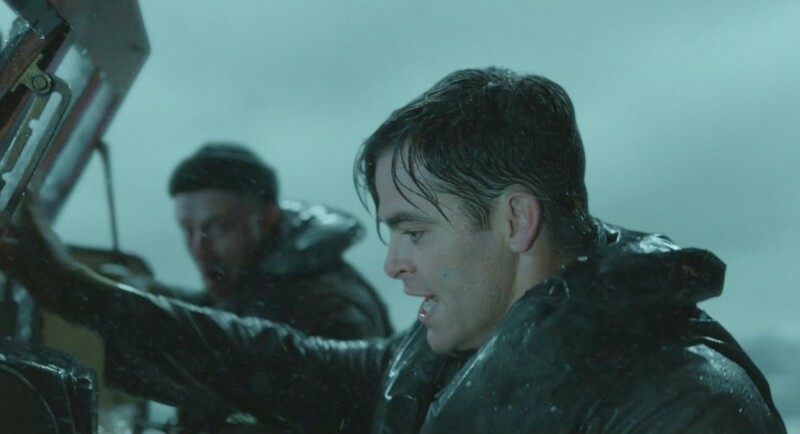 Based on a best selling non-fiction book, THE FINEST HOURS stars Chris Pine as Bernie Webber, who skippered the rescue boat, and Casey Affleck as Ray Sybert, who took charge to keep the men on the floundering wreckage of the Pendleton alive. As shy, by-the-book Webber, Pine is serviceable as he plays against type, which we have seen from his previous work he is more than capable of doing. For Affleck, virility rules as he embodies stoic man-of-action Sybert, the picture of an old Hollywood hero. He’s likely to set hearts a-flutter in the majority of female viewers, and given he is usually morphing himself into various physical versions of himself to best serve his role, it’s great to see him easily take on a classic Clark Gable mystique. Ben Foster, Eric Bana, and Holliday Grainger round out the co-starring cast , and are joined by a cavalcade of recognizable character actors almost worth the price of admission to see. 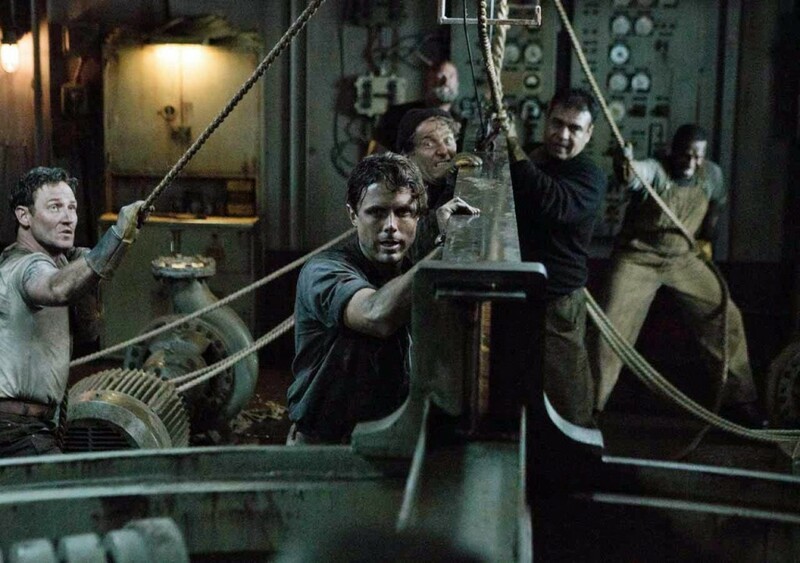 After Craig Gillespie directed Disney’s 2014 release MILLION DOLLAR ARM, based on a true story, the studio charged him to bring another reality- based story THE FINEST HOURS to the screen. The Disney element here is part of the problem, as is the classic Hollywood aesthetic he is going after. It’s like he’s trying to out-Spielberg Spielberg, who himself gets in trouble over being too sentimental. In Gillespie’s less experienced hands, the movie gets bogged down in visual cliches and obvious manipulations. Another problem is using a love story as the basic skeleton on which to build the story. As Bernie’s worried wife-to-be Miriam, Grainger is charming and earnest, but that entire aspect of the plot seems intentional audience targeting to bring out the date-night marrieds. This heroic story is all chills, and needs no frills. Why not just follow the men, and their death-defying battle with the elements and circumstances that ended in the greatest rescue in Coast Guard history? With such skilled actors onboard, that would have been more than enough. To water it down with extraneous plot devices, is to do the actual events an injustice. There are worse things than spending two hours experiencing the courage and determination in a heroic real life story, but THIS story tells itself. Everything else is too much Hollywood. As entertaining as Disney, the cast and crew attempt to make it, Bernie and the boys deserve more.